Deadlifting like a boss is all about being calm and composed. Play the long-term game if this suits your personality and lifting style. This is for someone who is a bit calmer and not as aggressive. If you mainly care about looks you will have a hard time. It takes a lot of discipline to look like the rock or Hugh Jackman. Prepare to be hungry, tired and grumpy. To get that shredded look most people will deny themselves what they want to become better. That is not always pretty. The main driver for success on this road is your diet. Know your calorie intake and macros to get ahead. Cut back on alcohol and sugar and stick to the plan. The choices you will make on this path will not always be healthy or help performance on the pitch. But that is not the goal anyway. You want to make it to the front cover of men’s health. If you are all about performance the framework is a little different. You want to set personal and world records. Holding the trophy and leaving your competition behind gives you satisfaction. The main driver for success is the intensity when you train. You have to train with focus and purpose to improve. Food will be your fuel but not the main driver for success. The choices you will make are not always healthy or pretty. Injuries will occur and you will have to learn how to deal with them. There is nothing better than making it to the top so you will enjoy every step in the way. The last group is all about health. If you belong to this group you want to strike a balance. You avoid the extremes. Injury and burn out therefore seldomly occur. You will sip on your tea and hug your yoga mat. Looking at the athletes and models out there gives you the feeling that they are missing out on what really matters in life. As you want to deadlift like a boss you are most likely bin the performance bracket. Take the time to think about what your goals actually are and why you want to achieve them. This will propel your performance into the stratosphere. The first thing to practice to deadlift like a boss is to be able to build tension. Through the entire lift, you want to be like a rod of steel and not as a string of spaghetti. To ensure maximum tension throughout the lift make sure that you are fully present in the moment. Forget about the job, your wife and friends and whatever you have planned for the evening. It is only you and the barbell. To get better at focus start meditating. Also, discipline yourself to focus on only one thing at work and getting it done. Mark Twain has a good quote on this. If you have to swallow two toads swallow the bigger one first. The next thing is your foot positioning. You want the middle of your feet directly under the bar. This is the same for sumo and conventional lifts. If the bar is too far away when you start to pull your deadlift turns into a row. You will also have leverage. To place your hands in a good way think of them as hooks on a crane. The deadlift is a hinge and not really a pull that comes from the arms. If you activate your biceps during the lift, you will likely rip it off. You don’t want to curl 100kg or more unless you are Captain America. Once the hands are in place it is time to take care of your breathing. Make sure that you build tension and push out with your stomach. What you want to achieve is a cylindrical pressure on all sides. Think of it like a can that you fill with water. You want all sides to be equally under tension. Otherwise, power seeps out at the weak ends. While you breathe and brace turn your elbows inwards. You should here the bar click when you do this. There are two good tips for this. The first is to imagine to squeeze oranges in your armpits while holding the bar. The other tip is to bend the bar around your shins like a horseshoe. This will neatly tie in with the next phase. When you have brought in the bar close to you have patience off the floor. This means rather than yanking the barbell immediately up and risking pulling your arms out of their socket, try to make it float. Think again of the crane example. A crane driver will first build maximum tension in the cables before he pulls a heavy weight off the ground. He won’t just pull the hinge up as fast as possible as this might rip the cables or lets the weight take off from the ground uncontrolled. Same goes for your deadlift. Keep all the tension until you are almost breaking ground. The initiate the pull. You initiate the pull by pushing your legs as hard into the ground as you can. Two good reminders are to push the floor away from you and to make a footprint. Even though a little counterintuitive, the deadlift is more of a push than a pull when done right. In this phase, you want to produce maximum force by pushing your feet in the ground as hard as possible. Keep the bar moving upwards and try to accelerate on the way up. Most lifters usually have a sticking point before the lockout. Especially conventional deadlifters. Speed and aggressiveness are crucial. Speed off the floor helps to postpone the point of the lift where it turns to a grind. Aggressiveness helps with popping the hips forward fast and decisively to lock the weight out. Any inefficiency will lead to lifting less. Therefore fix them one by one. Many lifters only use one of the two styles in their training. This is foolhardy. The best deadlifters in the world train both variations. Training conventional and sumo will help you to address the muscles involved in the deadlift in different ways. It keeps your routines more interesting and prevents injuries from overuse. Most often people make excuses for the sumo style and claim they lack mobility. If you lack mobility for the sumo deadlift you shouldn’t be squatting under load either. I personally like the sumo deadlift to build in volume into my training. Speed and maximum work is done with the conventional deadlift as it is my preferred stance. Even though shrugs are more popular with bodybuilders than with powerlifters they are a good option. If you want to deadlift like a pro you need a strong grip and good traps. For this barbell shrugs are your friend. One way of getting them in is to take the weight on your last work set and shrug it for 5 sets to failure. With a five rep weight at 70% intensity, I can usually do somewhere between 12 - 20 reps per set. 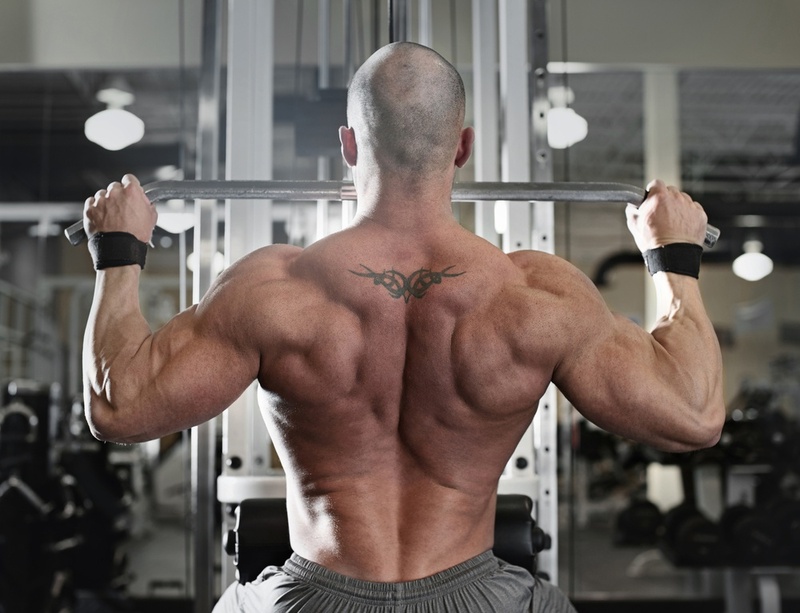 Another way of thickening your back for a better deadlift is to do Yates rows. Yates rows start with the bar just below the knee. From there you pull the barbell up to your belly button. For this yanking the bar is allowed. You these rows to be heavy. I usually do them with me deadlift work weight for 3 - 5 reps for 5 sets. This movement is high risk, high reward. If your back has a bad day, don’t do them. Once you are done with your barbell work it is time to finish the day with some Dumbbell work. Croc rows are a great way to finish up your deadlift day. Stand at the Dumbbell rack and put one hand on the rack. Croc rows are done while standing with both feet planted on the ground. Grab the Dumbbell with your hand. Take one step forward with the opposite leg. Take care that your back is straight. Do 5 sets for 8 - 12 repetitions with a fairly heavy Dumbbell. Deficit deadlifts are a bit more advanced. If you lack back mobility and if you have shortened hamstrings stay away from them. Step on a plate or mat to perform a deficit deadlift. The idea is to lengthen the range of motion by elevating yourself From the ground while the barbell stays level. The deficit deadlift especially helps with speed off the ground. Pick a weight which is challenging for two to three reps. Make sure you reset after each repetition. Doing touch and go reps on n deficit deadlifts defeats the purpose. Building a strong deadlift takes a decade and not one summer. You can build some good condition in a week. Strength needs more dedication. You will have setbacks, injuries, and plateaus. Keep at it. Mix the training up as I suggested. Get some coaching from others. When mobility becomes an issue do some yoga. You have to hold up for ten years to deadlift like a boss. If you want to be inspired look up Dan Green aka “The boss”. He dominates the deadlift and stays calm while doing it. He is sponsored by animal supplements and especially his cage performances are of interest.